I was bitten by the Color Bug over the weekend. The symptoms were an overwhelming desire to add color to my neutral black, white, and brown loft. I'm happy to report that I'm now fully recovered! 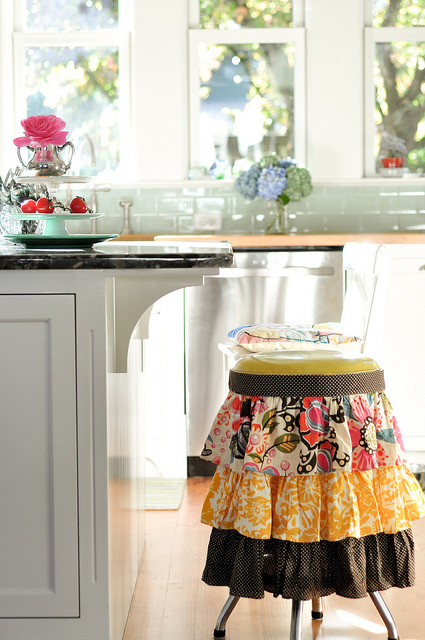 My prescription was this kitchen stool slipcover I saw on Kelly Rae Roberts' home tour. For my loft craft studio version I started with this $6 thrift store stool and painted the legs white. With no pattern to follow, I made up my slipcover as I went along. I made a paper pattern of the round seat and cut out a circle of the first of three (Jo-Ann 40% off coupon) fabrics. To the circle I sewed a strip of fabric to fit around the side of the seat and used an old pillow case, deconstructed and re-sewn, as a base on which to sew the ruffles. I gathered and hemmed my ruffles and attached them one at a time. There was a lot of measuring and pinning going on, using the stool as a dress dummy. Finally, all three ruffles were sewn in place. The first pop of color in my loft, and my color bug symptoms began to disappear. Amazing what a little color will do to lift your spirits and make you feel better. In no time at all I was back to my old self. Fortunately, I might be feeling a slight relapse coming on today, and I'm hoping a second dose of colorful fabric will help. But first, I have to consult Pinterest on the proper way to apply it. Thanks for coming today, and watch out for that Color Bug. It just might be catching! I'm linking to these great parties! Your stool is charming. Your bug might be catching! Love your girly stool...You must give her a name! And thanks for doing all the hard work and sharing the tutorial! I love this, Laurel! How adorable and pretty is that! I love the ruffled slipcover, I pinned it on my pinterest! That is ADORABLE! I know I have bar stools around here somewhere. ;) Great tutorial. I love the fun fabrics you chose. So happy! I'm madly in love with your slipcover. Tell me--how do you gather your ruffles? I love them, have done plenty of them, but usually have to work up the guts to go for it. What often happens to me is that I get nearly to the end of my ruffle gathering and my thread breaks. Dang! Your project is so, so lovely and bright. Oh my...this cutie is so going to be featured next week!!! Thanks for sharing it at my party! LOVE your ruffled slipcover! So bright, fun & cheery! I would love for you to share it at my party going on now at Jillify It! I love the pop of color! you did a great job! I been thinking of adding color too. I would love if you came by to link this up to my party happening now! OH wow! I love your ruffled stool! So cute and I don't sew often so I am hats off on that too. Your office looks dreamy. Totally cute and something I just might have to try and attempt if I have the patience! ;) Thanx for joining THT! Hope your week is going well! You did a great job--that stool is adorable! Cute project and I love the fabric choices! Hi Laurel, the color bug got you alright, and I totally love it!!! so cute, great combination of fabrics, really brightens up your space! Thanks so much for linking up with Vintage Inspiration! Oh my gosh! Your ruffled stool cover is the cutest thing I've seen in a long time! I have an old kitchen stool that I have been wanting to make over. I think she's going to get a slipcover one day soon! home in Kentucky. After raising our 3 grand daughters for 8 years I am now ready to create a space for me that I had to give up 10 years ago. I am disabled and suffer from depression. After seeing your space I am going to paint my furniture white to brighten up my space. Thanks so much for the inspiration. I plan to post the progress on my blog. Not much there now, but you just wait. I am so excited to be starting the twilight of my life even though I am only 57 going on 80(at least my body thinks that.) I am putting your blog in my Inspirational Sites I Love links.